This spice container was donated by the Jewish Cultural Reconstruction, a body tasked with distributing thousands of heirless Jewish objects looted by the Nazis. During World War II, the Nazis looted religious and cultural artifacts from individuals, museums, libraries, synagogues, churches and other institutions across Europe. Items that were not immediately destroyed were hidden by the Nazis, and many were recovered by the Allies after the war. The Jewish Cultural Reconstruction (JCR) was founded in 1947 to facilitate the distribution of some 500,000 Jewish objects whose ownership could not be established. Between the years 1949 and 1952, the JCR distributed these items to institutions in Israel, Europe, and America. This spice container was donated by the JCR to the College of Jewish Studies, predecessor of today’s Spertus Institute for Jewish Learning and Leadership. This delicate silver filigree container was used for passing around fragrant spices during the Havdalah service, a ceremony that marks the conclusion of Shabbat (the Jewish Sabbath). 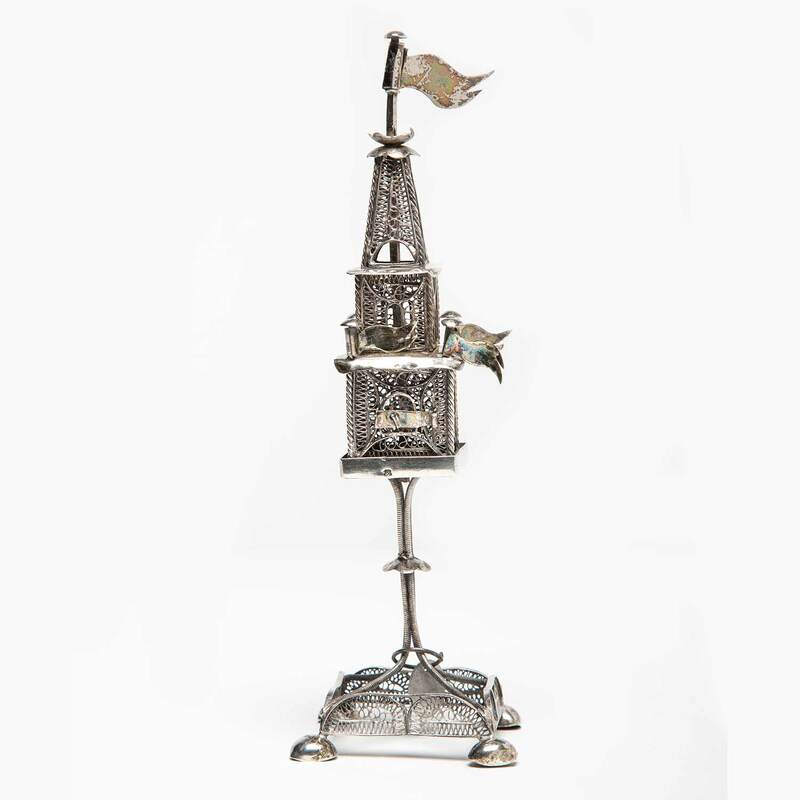 Since medieval times European Jews modeled their Havdalah spice containers (in Hebrew, besamim or hadas) after multi-storied towers, which were familiar features of the urban landscape. Note the small hinged door used for placing cloves or other aromatics in its inner chamber. Credit: Gift of the College of Jewish Studies, Provenance: Jewish Cultural Reconstruction, Inc.